On July 25, Germany surpassed the old record of 74 percent renewable electricity. But perhaps the most interesting aspect is power trading between France and Germany on that day. Craig Morris explains. At the end of July, the storm Zeljko passed over northern Europe, causing considerable wind damage and flooding in some areas. Here in southern Germany, however, it was a relatively sunny day. In the north, where it was windy, Germany has most of its wind turbines installed. In the south, it has most of its solar. The combination of sunny weather in the south with strong wind throughout the country is rare – and led to a new record. The chart above visualizes the situation well, but we still need to include biomass (4.85 GW) and hydropower (2.4 GW). The total renewable electricity on Saturday afternoon was therefore 47.9 GW. We then also need to exclude the 8.75 GW of net power exports below the baseline in the chart above to calculate total domestic power demand, which then comes in at 61.1 GW. In that calculation, Germany had roughly 78 percent renewable electricity as a share of domestic demand for a few hours. The figures are still preliminary, however. On the Energy Charts website, you can switch from the view above to “all sources,” and you get slightly different (lower) numbers for both wind and solar during the exact same timeframe. In addition, the data will probably still be tweaked because they are so new. But in all likelihood, further revisions will still have a new record posted that day. The preliminary figures given at Agora also have renewables making up 79 percent of domestic power consumption that day. We don’t need to look far for a very low share of renewables, however. In the wee hours of July 22, wind power dropped to 2-3 GW, with solar at 0. Add in hydropower and biomass, and we have around 9.5 GW of renewable electricity out of just under 40 GW of domestic demand. In other words, it is now hard for renewable electricity to be pushed far below 25 percent of domestic demand in the summer. 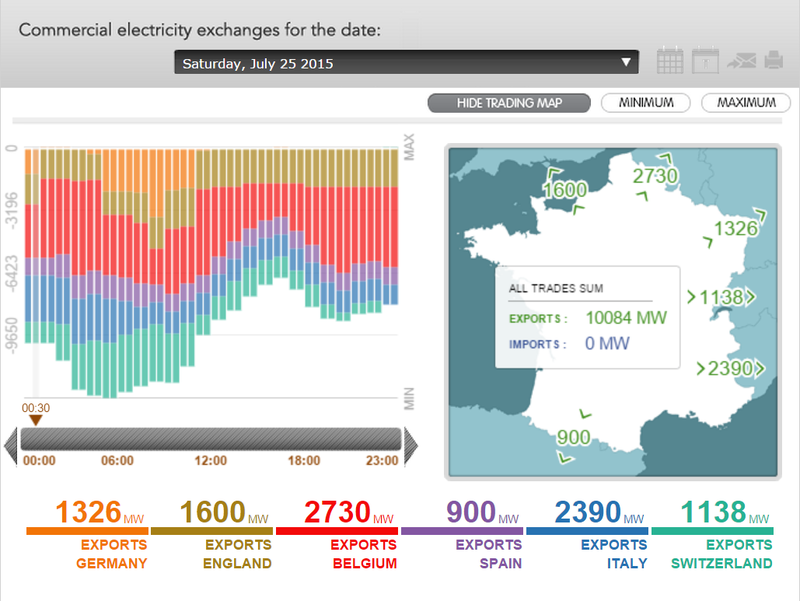 Though Germany was a net exporter of electricity at the time, the trading situation with France is illustrative. The chart below from French grid operator RTE shows that France was a tremendous net exporter of electricity on Saturday, July 25 – at a time of low power demand. During the early morning, Germany (orange bars on the left) imported a tremendous amount of electricity – not because it needed it, but because French nuclear plants do not like to ramp down any more than the German ones do, so they were selling power to the Germans cheaply. This situation once again disproves the common notion that Germany can “rely” on French nuclear when it needs power. In reality, trading takes place based on price, not dire need to prevent blackouts. 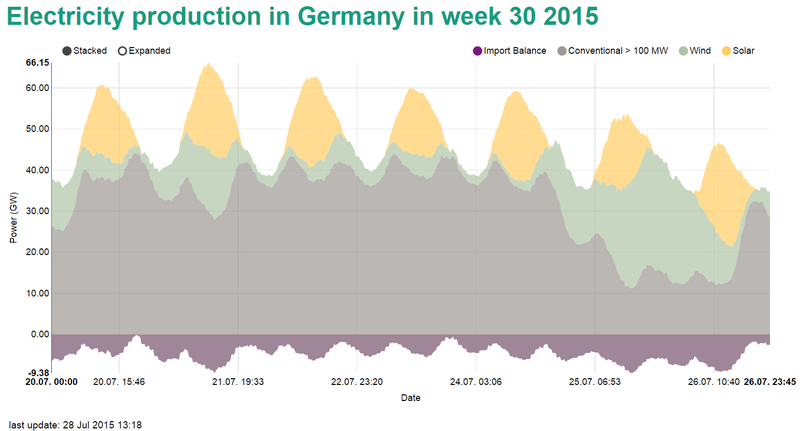 The Germans import nuclear power when demand – and hence the spot market price – is low. A look at the trading prices reveals in fact that the German prices were a bit higher that Saturday. Peak and base prices averaged around 1.5 cents per kilowatt-hour in the Phelix zone (Germany and Austria), whereas French prices were closer to two cents. At those prices, the French should have been importing from Germany – but there simply was no need, and any imports would have forced the country to ramp down its nuclear plants even further. It’s further proof of the fundamental incompatibility of inflexible nuclear power with fluctuating wind and solar. This 25th of July deserves a place in the Energiewende history records. And the lesson is? Storage, storage and storage again. The big question is: can we develop economic forms of storage? Hard coal and lignite seem to be the most compatible partners to renewables? Not hydro, bioenergy or nuclear? It will never get to 100% over a year’s time. That is why we will still need Nuclear power- the safest source of power. I wonder if coal and gas will come back the way they were. 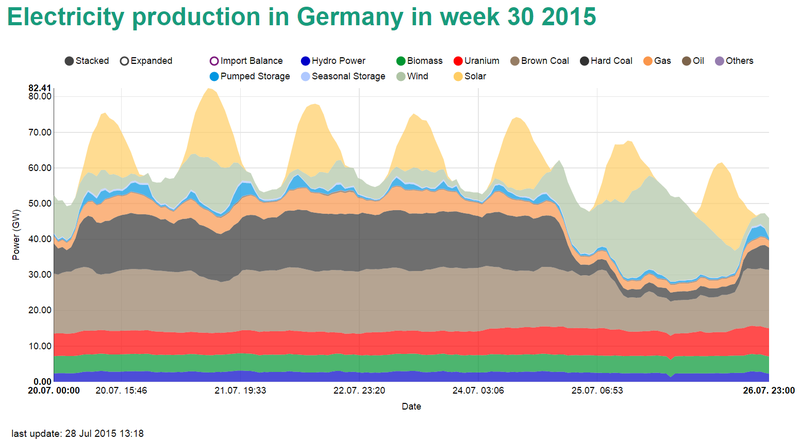 I see Germany set a record a few days ago of getting 78% of their electrical energy from renewables for a few hours. Some say they’ll never go completely renewable, but as storage techniques improve and the desire for energy security increases – well, the trend is there. These graphs also show very clearly why PV was forbidden at this penetration rate. Clearly baseload is a limitation, not a feature. We put up with baseload because it was cheap. Now solar and wind are cheaper, and we will put up with their predictable intermittence. For that we need of the flexible reserve and peaking generators, including hydro, and demand reduction. With enough solar, wind, and hydro we can get the need to reserve generators down to 10% or so. Then fuel those with hydrocarbons from wastes. Electric vehicles with smart grid connections would really help for replacing spinning reserve, even in grid without much renewables. Spinning waste a lot of energy by running generators as less than optimum power output. 5% of the ecars battery rented to the Grid would pay for the batteries and probably the car given the going price for spinning reserve and frequency stabilization, which batteries excel at. Germany is doing renewables while the USA still argues about if it’s possible. Storage is not the only solution to renewables overproduction. There are also intermediate demand posibilities. For example, water desalination is best done when electricity is cheap. The excess water can be stored easily. For the last century or so, we have been building our industries around the concept of baseload. As intermittent cheap energy starts to dominate the market, new business models will take advantage of it.